The 10th anniversary edition of the Dutch Game Awards will be held on 6 October 2017 during the Firstlook Festival at the Jaarbeurs in Utrecht. The awards, in the shape of a cyber owl, will be presented to the best Dutch games and game companies. Firstlook Festival, also celebrating its 10th edition this year, will be the host of this special edition. In cooperation with Gamekings, Dutch consumers will also be able to vote on their favorite Dutch game. Companies and students can now register their games at dutchgameawards.nl until 10 July. A new award has been introduced, the Best Virtual Reality Game. Dutch studios have shown that they can make great games in this new genre. The tactical game Landfall and the zombie game Arizona Sunshine are nice examples of the quality of Dutch VR games made in the past year. After 10 years, it is now also time to celebrate the best Dutch developer or studio with a Lifetime Achievement Award. 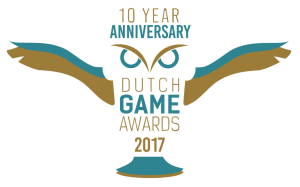 The Award will be presented to the person or company that has made the largest contribution to the Dutch game industry in the past 10 years. The Dutch Game Awards organization will determine the winner in collaboration with her patrons. Everyone can propose candidates through the special form on the website. To enter the competition, games can be registered for the Dutch Game Awards starting 21 June at the website dutchgameawards.nl. Registration is open until 10 July, end of day. Companies from the Netherlands that develop games or contribute to the production can register their games. The competition is also open to students. Registration will be open until 10 July, end of day. Mid September the nominees will be announced. In total there are 16 awards. A professional jury will determine the winner for 14 of these categories. Gamekings will determine a winner for the audience award together with their viewers, and the patrons of the Dutch Game Awards will determine the winner of the Lifetime Achievement award. An overview of all the categories can be found on the website of the Dutch Game Awards. 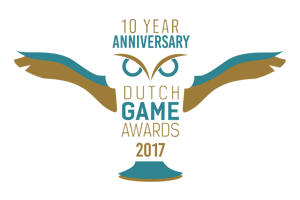 The awards will be presented at the Awards Dinner during Firstlook Festival on 6 October in the evening. The Dutch Game Awards are made possible by a contribution from the Ministry of Education, Culture, and Science, and by the support of a large number of patrons within the Dutch game industry.